Chemical/ Small Molecule corresponding to 5-methylcytosine (5-mC). Storage in frost-free freezers is not recommended. Should this product contain a precipitate microcentrifugation before use.While older lots have performed well in ICC, we have received inconsistent results with the latest lots. Unfortunately, we can no longer guarantee this antibody for use in ICC. 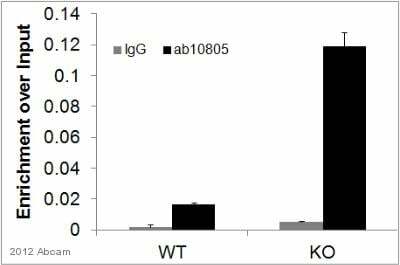 Ab10805 recognises the modified base 5-methylcytidine found in DNA of plants and vertebrates. DNA methylation is a DNA modification process, which is involved in the control of gene expression. Reports suggest that in tumours, DNA is frequently globally hypomethylated compared to the DNA from normal tissue. Our Abpromise guarantee covers the use of ab10805 in the following tested applications. MeDIP Use at an assay dependent concentration. PubMed: 17845077Used 5ul in 200ul reaction with 2ug digested genomic DNA from Drosophila. Use 10ul of working dilution to label 1000000 cells in 100ul. (see Habib, M. et al. (1999)). The native context of double-stranded DNA may obstruct antibody binding to 5-methylcytosine. For successful detection of 5-methylcytosine, we recommend that the DNA is denatured to make the nucleotides accessible for the antibody. Denaturing methods vary depending on each application. ab10805 staining 5-Methyl Cytidine in pig embryo (15 to 17 days) tissue section by Immunohistochemistry (Formalin/PFA-fixed paraffin-embedded sections). Tissue underwent fixation in paraformaldehyde, heat mediated antigen retrieval in Tris-EDTA buffer, permeabilization in Triton X-100 and blocking in 2% BSA for 10 minutes at 25°C. The primary antibody was diluted, 1/100 (PBS + 2% BSA) and incubated with sample for 1 hour at 25°C. An Alexa Fluor® 488 conjugated donkey polyclonal to mouse at 1/250 dilution, was used as secondary. 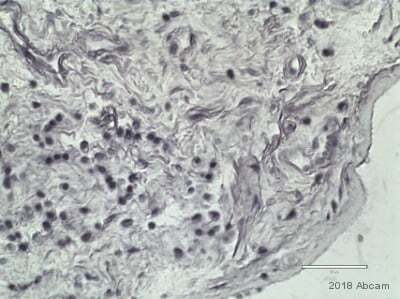 ChIP - Anti-5-methylcytosine (5-mC) antibody [33D3] (ab10805)This image is courtesy of an anonymous Abreview. 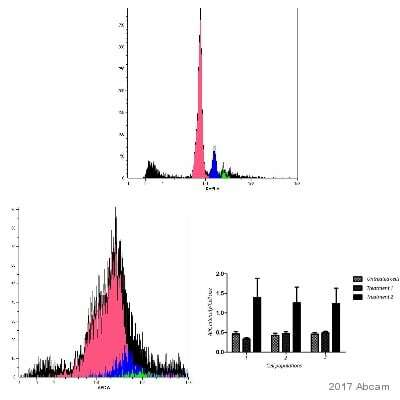 Native ChIP analysis using unpurified ab10805 binding 5-methylcytosine (5-mC) in nuclear cell lysate derived from mouse embryonic stem cells. Samples were incubated with primary antibody (2µg/µg chromatin) for 16 hours at 4°C in a Glycerol IP buffer. Protein binding was detected using real-time PCR. Positive control: Magoh2 in HMT KO cells. Negative Control: Magoh2 in WT cells. Dot blot carried out using ab10805 (left blot), showing specificity to 5-methylcytosine. Indicated amounts (20–5 ng) of oligonucleotides containing either 5mC (50%) or 5hmC (20 %) were spotted on positive charged nylon membrane and detected either with 5mC (ab10805) or 5hmC antibody. Cell harvesting/tissue preparation method: Tissue were dissociated with collagenase. Obtained cells were filtered and fixed. Inquiry: Does the antibody recognise m5C in RNA? Is it then still specific to the modification? ab10805 specifically binds to single modified cytosine so it should bind to 5-Methylcytosine in RNA as well. Can the Anti-5-Methyl Cytidine antibody [33D3] - ChIP Grade (ab10805) distinguish 5-mc and 5-hmc? Thank you for contacting us. While we have no tested the specificity for 5-hmC in house, customers have reported that this clone does not recognize 5-hmC. Unfortunately, we do not currently have any data regarding this reactivity. 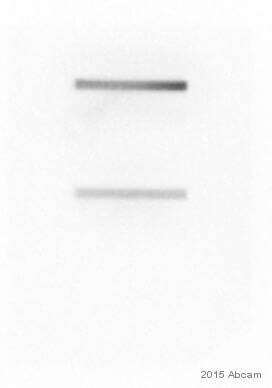 Hi, I am currently using your ab10805 (anti-5mC) antibody. Does this antibody recognize a single 5mC or recognize an oligonucleotide sequence with 5mC in between? ab10805 should recognize single 5-methyl cytidine.